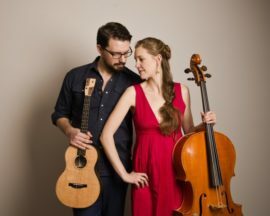 James Hill and Anne Janelle are musicians who demonstrate that opposites attract and can make beautiful music together. James plays the ukulele, a strummed instrument that produces high, short notes. Anne’s cello provides long, low, bowed notes. The result is marvellously complementary, award-winning, world-class ukulele and cello music. James is a singer, songwriter, passionate educator, seasoned performer, and an absolute wizard on the ukulele. His playing defies all stereotypes of the instrument and ranges from catchy and energetic to haunting and beautiful. Anne Janelle is a classically trained cellist-turned-songwriter. She combines the elegance of her formal cello background with fearless curiosity to produce songs steeped in the rich traditions of folk, pop, and jazz. By chance, James and Anne were selected to record together for a compilation album; otherwise, they say that it’s unlikely that they would have ever played together. For music fans everywhere, it’s a good thing they did. Although both have produced excellent solo work, there is real magic when they combine their talents. Their 2009 recording, True Love Don’t Weep, earned them a Canadian Folk Music Award and showcased their extraordinary musicianship. This real life and music couple is based in Halifax.